This article is about the present security cooperation within the legal framework of the European Union. For a wider presentation, including national capabilities and initiatives of cooperation established outside this legal framework, see Military of the European Union. The Common Security and Defence Policy (CSDP), formerly known as the European Security and Defence Policy (ESDP), is a major element of the Common Foreign and Security Policy of the European Union (EU) and is the domain of EU policy covering defence and military aspects, as well as civilian crisis management. The ESDP was the successor of the European Security and Defence Identity under NATO, but differs in that it falls under the jurisdiction of the European Union itself, including countries with no ties to NATO. Formally, the Common Security and Defence Policy is the domain of the European Council, which is an EU institution, whereby the heads of member states meet. Nonetheless, the High Representative of the Union for Foreign Affairs and Security Policy, currently Federica Mogherini, also plays a significant role. As Chairperson of the external relations configuration of the Council, the High Representative prepares and examines decisions to be made before they are brought to the Council. European security policy has followed several different paths during the 1990s, developing simultaneously within the Western European Union, NATO and the European Union itself. Earlier efforts were made to have a common European security and defence policy. The 1947 Treaty of Dunkirk between UK and France was a European alliance and mutual assistance agreement after WWII. This agreement was 1948 transferred to the military Article 4 of the Treaty of Brussels which included the BeNeLux countries. To reach the treaty goals the Western Union Defence Organization was set up 1948 with an allied European command structure under British Field Marshal Montgomery. In 1949 the United States and Canada joined the alliance and its mutual defence agreements through the North Atlantic Treaty with its Article 5 mutual defence clause which differed from the Brussels Treaty as it did not necessarily include military response. In 1950 the European Defence Community (EDC), similar in nature to European Coal and Steel Community, was proposed but failed ratification in the French parliament. The military Western Union Defence Organization was during the 1950-1953 Korean War augmented to become the North Atlantic Treaty Organization of the cold war. The failure to establish the EDC resulted in the 1954 amendment of the Treaty of Brussels at the London and Paris Conferences which in replacement of EDC established the political Western European Union (WEU) out of the earlier established Western Union Defence Organization and included West Germany and Italy in both WEU and NATO as the conference ended the occupation of West Germany and the defence aims had shifted from Germany to the Soviet Union. At the 1996 NATO ministerial meeting in Berlin, it was agreed that the Western European Union (WEU) would oversee the creation of a European Security and Defence Identity within NATO structures. The ESDI was to create a European 'pillar' within NATO, partly to allow European countries to act militarily where NATO wished not to, and partly to alleviate the United States' financial burden of maintaining military bases in Europe, which it had done since the Cold War. The Berlin agreement allowed European countries (through the WEU) to use NATO assets if it so wished (this agreement was later amended to allow the European Union to conduct such missions, the so-called Berlin-plus arrangement). The European Union incorporated the same Petersberg tasks within its domain with the Amsterdam Treaty. The treaty signalled the progressive framing of a common security and defence policy based on the Petersberg tasks. In 1998, traditional British reluctance to such a plan changed into endorsement after a bilateral declaration of French President Jacques Chirac and the British Prime Minister Tony Blair in St. Malo, where they stated that "the Union must have the capacity for autonomous action, backed up by credible military forces, the means to decide to use them, and a readiness to do so, in order to respond to international crises". In June 1999, the Cologne European Council decided to incorporate the role of the Western European Union within the EU, eventually shutting down the WEU. The Cologne Council also appointed Javier Solana as the High Representative for Common Foreign and Security Policy to help progress both the CFSP and the ESDP. Concerns were voiced that an independent European security pillar might result in a declining importance of NATO as a transatlantic forum. In response to St. Malo, the former US-Secretary of State Madeleine Albright put forth the three famous D’s, which outline American expectations towards ESDP to this day: no duplication of what was done effectively under NATO, no decoupling from the US and NATO, and no discrimination against non-EU members such as Turkey. In the joint EU-NATO declaration of 2002, the six founding principles included partnership—for example, crisis management activities should be "mutually reinforcing"—effective mutual consultation and cooperation, equality and due regard for ‘the decision-making autonomy and interests’ of both EU and NATO, and ‘coherent and mutually reinforcing development of the military capability requirements common to the two organisations’. In institutional terms, the partnership is reflected in particular by the "Berlin plus agreement" from March 2003, which allows the EU to use NATO structures, mechanisms and assets to carry out military operations if NATO declines to act. Furthermore, an agreement has been signed on information sharing between the EU and NATO, and EU liaison cells are now in place at SHAPE (NATO’s strategic nerve centre for planning and operations) and NATO’s Joint Force Command in Naples. A phrase that is often used to describe the relationship between the EU forces and NATO is "separable, but not separate": the same forces and capabilities form the basis of both EU and NATO efforts, but portions can be allocated to the European Union if necessary. The right of first refusal governs missions: the EU may only act if NATO first decides not to. The European Security Strategy was written in 2003 and was the policy document that guided for a time the European Union's international security strategy. Its headline reads: "A Secure Europe In A Better World". The document was approved by the European Council held in Brussels on 12 December 2003 and drafted under the responsibilities of the EU High Representative for Common Foreign and Security Policy CFSP Javier Solana. With the emergence of the ESDP, it is the first time that Europe has formulated a joint security strategy. It can be considered a counterpart to the National Security Strategy of the United States. The document starts out with the declaration that "Europe has never been so prosperous, so secure nor so free". Its conclusion is that "The world is full of new dangers and opportunities". Along these lines, it argues that in order to ensure security for Europe in a globalising world, multilateral cooperation within Europe and abroad is to be the imperative, because "no single nation is able to tackle today's complex challenges". As such the ESS identifies a string of key threats Europe needs to deal with: terrorism, proliferation of weapons of mass destruction, regional conflict, failed states, and organised crime. The document was followed by the 2008 Report of the Implementation of the European Security Strategy: Providing Security in a Changing World. It concludes with the admonition "To build a secure Europe in a better world, we must do more to shape events. And we must do it now." The European Defence Agency (EDA) was established in July 2004 and is based in Brussels. It supports the EU Member States in improving their military capabilities in order to complete CSDP targets as set out in the European Security Strategy. In that capacity, it makes proposals, coordinates, stimulates collaboration, and runs projects. The Member States themselves, however, remain in charge of their defence policies, planning and investment. 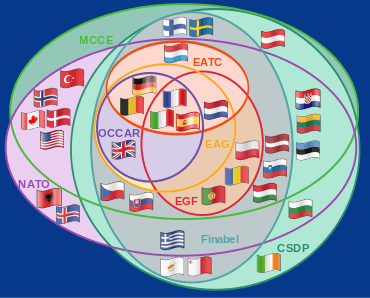 Four strategies form the framework to guide the activities of the Agency and its 26 participating Member States: 1) the Capability Development Plan (CDP), 2) the European Defence Research & Technology; 3) the European Armaments Cooperation (EAC) and 4) the European Defence Technological and Industrial Base (EDTIB). The EU Institute for Security Studies (EU-ISS) was inaugurated in January 2002 and is based in Paris. Although an EU agency, it is an autonomous think tank that researches EU-relevant security issues. The research results are published in papers, books, reports, policy briefs, analyses and newsletters. In addition, the EU-ISS convenes seminars and conferences on relevant issues that bring together EU officials, national experts, decision-makers and NGO representatives from all Member States. 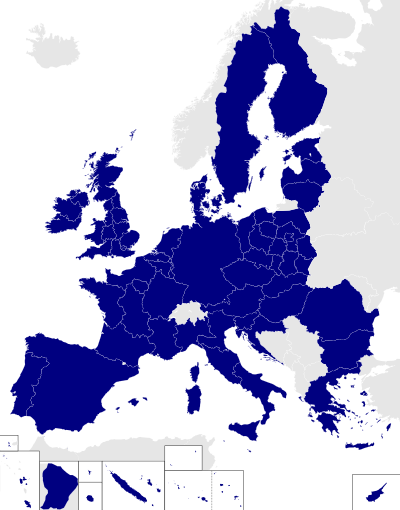 The European Union Satellite Centre was incorporated as an agency of the European Union (EU) on 1 January 2002. It is located in Torrejón de Ardoz, in the vicinity of Madrid, Spain. 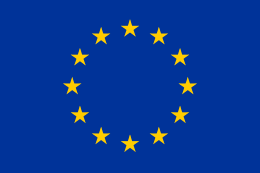 The centre supports the decision-making of the European Union in the field of the Common Foreign and Security Policy (CFSP), including crisis management missions and operations, by providing products and services resulting from the exploitation of relevant space assets and collateral data, including satellite and aerial imagery, and related services. The 2009 Treaty of Lisbon renamed the ESDP to Common Security and Defence Policy (CSDP). The post of High Representative of the Union for Foreign Affairs and Security Policy has been created (superseding the High Representative for the Common Foreign and Security Policy and European Commissioner for External Relations and European Neighbourhood Policy). Unanimous decisions in the Council of the European Union continue to instruct the EU foreign policy and CSDP matters became available to enhanced co-operation. The common security and defence policy shall include the progressive framing of a common Union defence policy. This will lead to a common defence, when the European Council, acting unanimously, so decides. It shall in that case recommend to the member States the adoption of such a decision in accordance with their respective constitutional requirements. The policy of the Union in accordance with this article shall not prejudice the specific character of the security and defence policy of certain member states, which see their common defence realised in the North Atlantic Treaty Organisation, under the North Atlantic Treaty, and be compatible with the common security and defence policy established within that framework. 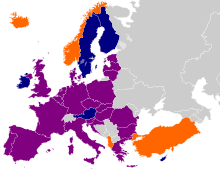 Lisbon also led to the termination of the Western European Union in 2010 as, with the solidarity clause (deemed to supersede the WEU's military mutual defence clause) and the expansion of the CSDP, the WEU became redundant. All its remaining activities are to be wound up or transferred to the EU by June 2011. Lisbon extends the enhanced co-operation mechanism to defence issues and also envisions the establishment of a Permanent Structured Cooperation in Defence. The first deployment of European troops under the ESDP, following the 1999 declaration of intent, was in March 2003 in the Republic of Macedonia. "EUFOR Concordia" used NATO assets and was considered a success and replaced by a smaller police mission, EUPOL Proxima, later that year. Since then, there have been other small police, justice and monitoring missions. As well as the Republic of Macedonia, the EU has maintained its deployment of peacekeepers in Bosnia and Herzegovina, as part of EUFOR Althea mission. Between May and September 2003 EU troops were deployed to the Democratic Republic of the Congo (DRC) during "Operation Artemis" under a mandate given by UN Security Council Resolution 1484 which aimed to prevent further atrocities and violence in the Ituri Conflict and put the DRC's peace process back on track. This laid out the "framework nation" system to be used in future deployments. The EU returned to the DRC during July–November 2006 with EUFOR RD Congo, which supported the UN mission there during the country's elections. 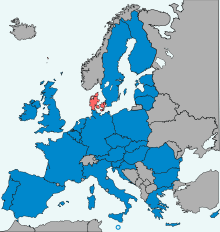 Geographically, EU missions outside the Balkans and the DRC have taken place in Georgia, Indonesia, Sudan, Palestine, and Ukraine-Moldova. There is also a judicial mission in Iraq (EUJUST Lex). On 28 January 2008, the EU deployed its largest and most multi-national mission to Africa, EUFOR Tchad/RCA. The UN-mandated mission involves troops from 25 EU states (19 in the field) deployed in areas of eastern Chad and the north-eastern Central African Republic in order to improve security in those regions. EUFOR Tchad/RCA reached full operation capability in mid-September 2008, and handed over security duties to the UN (MINURCAT mission) in mid-March 2009. The following permanent political and military bodies were established after the approval of the European Council. The CSDP is furthermore strongly facilitated by the European External Action Service. From 1 January 2007, the EU Operations Centre began work in Brussels. It can command a limited size force of about 2000 troops (e.g. a battlegroup). In addition to the EU centre, 5 national operational headquarters have been made available for use by the Union; Mont Valérien in Paris, Northwood in London, Potsdam, Centocelle in Rome and Larissa. For example, Operation Artemis used Mont Valérien as its OHQ and EUFOR's DR Congo operation uses Potsdam. The EU can also use NATO capabilities. With effect from 1 January 2007, the EU will have a third option for commanding, from Brussels, missions and operations of limited size (that is, like that of a battlegroup: some 2,000 troops). On that date, the new EU Operations Centre (EUOC) within the EU Military Staff (EUMS) will be ready for action. Using some EUMS core staff, as well as some extra “double-hatted” EUMS officers and so-called “augmentees” from the Member States, the EU will have an increased capacity to respond to crisis management situations. So far, the EU has had two options as to how to run a military operation at the Operation Headquarters (OHQ) level. One option is, in a so-called “autonomous” operation, to make use of facilities provided by any of the five Operation Headquarters (OHQs) currently available in European Member States. A second option is, through recourse to NATO capabilities and common assets (under the so-called “Berlin plus” arrangements), to make use of command and control options such as Operation Headquarters located at Supreme Headquarters, Allied Powers Europe (SHAPE) in Mons, Belgium and D-SACEUR as the Operation Commander. This is the option used in the conduct of Operation ALTHEA, where EUFOR BiH operates in Bosnia and Herzegovina. ↑ CDI Military Reform Project - European Union - Centre for Defence Information Archived March 9, 2012, at the Wayback Machine. ↑ The full report can be found here. ↑ Christopher S. Chivvis, "Birthing Athena. The Uncertain Future of ESDP", Focus stratégique, Paris, Ifri, March 2008. ↑ Benjamin Pohl (2013) The logic underpinning EU crisis management operations, European Security, 22(3): 307-325, DOI:10.1080/09662839.2012.726220, p. 311. 1 2 EU Operations Centre consilium.europa.eu. Archived at Wayback Machine on 30 Mar 2008. "Guide to the ESDP" nov.2008 edition Exhaustive guide on ESDP's missions, institutions and operations, written and edited by the Permanent representation of France to the European Union. Dijkstra, Hylke (2013). Policy-Making in EU Security and Defense: An Institutional Perspective. European Administrative Governance Series (Hardback 240pp ed.). Palgrave Macmillan, Basingstoke. ISBN 978-1-137-35786-1. Nugent, Neill (2006). The Government and Politics of the European Union. The European Union Series (Paperback 630pp ed.). Palgrave Macmillan, New York. ISBN 978-1-137-35786-1. Howorth, Joylon (2007). Security and Defence Policy in the European Union. The European Union Series (Paperback 315pp ed.). Palgrave Macmillan, New York. ISBN 978-0-333-63912-2. Hayes, Ben (2009). NeoConOpticon: The EU Security-Industrial Complex (Paperback, 84 pp ed.). Transnational Institute/Statewatch. ISSN 1756-851X. Teresa Eder (2014). Welche Befugnisse hat die Europäische Gendarmerietruppe?, Der Standard, 5 Februar 2014. Alexander Mattelaer (2008). The Strategic Planning of EU Military Operations - The Case of EUFOR Tchad/RCA, IES Working Paper 5/2008. "The Russo-Georgian War and Beyond: towards a European Great Power Concert", Danish Institute of International Studies. Mai'a K. Davis Cross "Security Integration in Europe: How Knowledge-based Networks are Transforming the European Union." University of Michigan Press, 2011.